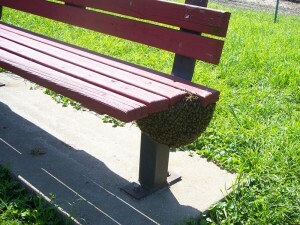 Do you think you have found a swarm of honeybees? Our association does offer a swarm collection service, where one of our members will come and remove the bees and re-hive. In preparation honey bees gorge on honey prior to their journey in search of a suitable nesting site. When they are ready to go the bees leave the hive and can appear as a cloud in the air. We tend to spot them when they are resting as a cluster with the Queen at their centre. Without her there is no future for the colony. If you think you have a swarm please leave it alone. Swarmed honeybees are usually docile (their stomachs are full of honey) but provoking them is not a good idea. 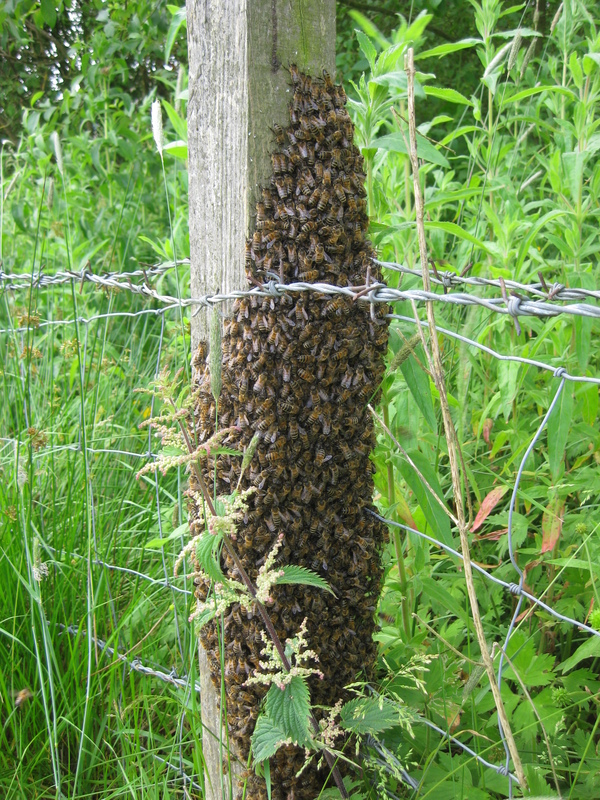 Swarms can be badly damaged by high winds and heavy rainfall, so please do contact us as soon as posssible if you see a swarm. Please also try to ensure what you have is a swarm of honeybees, please click on this link to help identify what you have found. If you are still not sure feel free to ring any of our swarm collectors and they will do their best to offer advice and sort out the problem. A small charge may be made to collect swarms to cover expenses of the individual collector. Please note that all of our swarm collectors are volunteers and may not be able to respond immediately. To find the nearest swarm collector to you, then please click on the following link and enter your postcode at STEP 4.